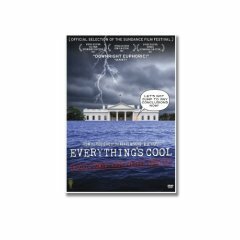 Tomorrow is the release date for a movie on climate change called Everything’s Cool, an official selection from the 2007 Sundance Film Festival. This documentary examines the chasm that has developed between scientific knowledge about climate change and the lack of political action on the part of the US government. Featuring renowned scientists and journalists, Everything’s Cool is directed by Daniel B. Gold and Judith Helfand. This film has not been rated, but it would be an excellent catalyst for discussion with junior high and high school students, as well as adults who still do not recognize the need for immediate action to curb the effects of global warming. Everything’s Cool begins with quotes from average Americans regarding global warming. One man from Ohio, my home state, says that global warming is “much less threatening than weapons of mass destruction. Come on guys, use your head. It is anti-American.” This is the mentality that has resulted in the widening of the chasm between scientific knowledge and politics, often encouraged by the media in an effort to portray “balanced” reporting by giving equal weight to science and global warming critics. A recurring theme throughout Everything’s Cool is how the economy and the environment have been pitted against each other in the “debate” on climate change. The argument is that we will create economic instability if we make the changes required to curb our carbon production. The truth is not so, as jobs will be created to research and develop the technologies we need to lead the world in solving this problem. If we do not have a hospitable climate to live in, the economy will be affected. As discussed by Dr. Heidi Cullen in the film, it is happening already. Ironically, oil exploration is being affected by the melting tundra, shortening the season in which oil companies can look for new sites to drill. The oil companies are already feeling the effects of climate change, when will the rest of America wake up? Also featured in Everything’s Cool is Bish Neuhouser, a ski slope groomer from Park City, Utah. Bish attempts to make his own straight vegetable oil (SVO) biodiesel in the movie, and he triumphantly takes that first trip down the road on French fries fuel with his friends. Despite his success, he succumbs to buying B20 instead of making his own biodiesel. B20 contains only 20 percent biodiesel and can be bought at the pump in Park City. Bish also convinces the ski resort he works for to convert their equipment to B20. Although it is not mentioned in the movie, 100 percent biodiesel does present a problem in cold temperatures, like those in Park City. My husband’s truck wouldn’t start for three days this winter when the B99 in his tank had solidified. The news about climate change has been discussed by the media for two decades, but little action has been taken by our government. In fact, the cover of Time magazine broke the news in 1987; however, real action supported by our government has yet to occur. Just last week, while my car was being repaired, I wandered into the new car parking lot at a dealership to see what was available. I was in shock to discover that the same model of car I own has not increased its gas mileage efficiency in the six years since I purchased my car. How can this be? Everything’s Cool is dubbed ” A toxic comedy about global warming”. I don’t really understand this tagline, as I found nothing humorous in the film. Quite the contrary, the news is disturbing, especially when the funding sources for the skeptics of climate change and our government’s hand in editing scientific discoveries are revealed. The film ends on a positive note: the chasm is narrowing, thanks to Hurricane Katrina and the efforts of activists. Will our next president lead the way to solving this global problem on a global scale? It’s obvious the current administration does not care.